When your list of to-dos is endless but your time is limited, it is easy to feel overwhelmed. Sometimes we don't have the luxury of dedicating a day, a week or a month to the task of maintaining our homes. 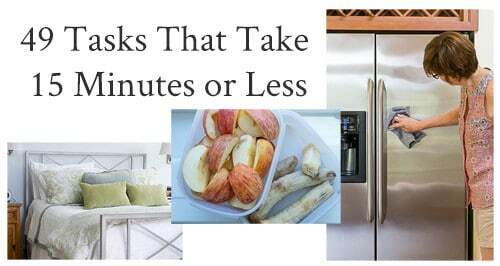 This list of 49 Quick Household Tasks That Take 15 minutes or Less will help you stay on top of the stuff that needs staying on top off! I know I am not alone right now in feeling that my home and all it's ‘stuff' have really gotten the better of me. Like many of you, this summer has been one chock full of travel, entertaining and good times. Oh, and yeah, we are also trying to sell our home, move my parents and prepare my son to go away to college…like next week. While a great deal of fun, it also meant that we would come home, unpack, do laundry, repack and hit the road again or completely pivot to help my parents move or organize for college. All good and wonderful, but it meant the little bits and bobs of life got stored where they don't belong or were completely neglected along the way. When I recently landed home for an extended period of time, I was a bit paralyzed when I thought of everything that needed attention…from the yard to the fridge and all things in between. I am typically of the ‘Go Big or Go Home' mindset when I undertake a project. You might remember that 2 years ago we spent the month of January clearing our home of clutter (over 1,000 pounds of clutter I might add). We dove in with both feet, and with a single-minded focus that was perfectly suited for the cold and dreary January days. However, I don't have the luxury of clearing my calendar right now, nor I expect, do many of you. So what do we do when the list of to-dos is seemingly endless and our time to focus on them is limited? We just chip away, in little bits, ultimately making the progress that we need to make. I brainstormed these quick household tasks, that could take 15-minutes or less, that I could do while dinner was cooking or while I had 15 minutes before I had to leave the house for an appointment or if I was waiting for a repairman to arrive or to just allocate throughout the day. And while I tasked myself with trying to find chores that could be done within 15 minutes, surely you could spend as much time as you have. And I have to tell you, just doing a few of these quick household tasks each day has really helped me feel a little more in control of my world. Some of these, like #22-#24, can be done while sitting in traffic, filling your car with gas or if arriving early for an appointment. 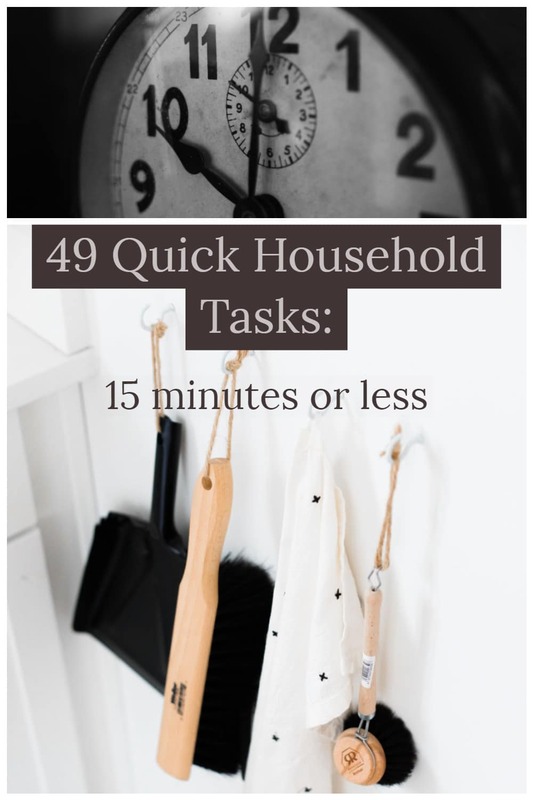 So, here's my list of 49 Quick Household Tasks That Take 15 Minutes or Less and help me stay sane and feel productive. And as always, I'd love for you to chime in with your suggestions! What are some of your go-to quick household tasks? Scan fridge and remove past prime food. While you may not have time to clean the whole refrigerator, you could probably clean one drawer or one shelf. Does your ice bin need to be emptied? I know my ice gets stale after a bit. If you have to empty the ice bin, put 2 cups of the ice and a cup of rock salt (or coarse salt) in your garbage disposal and run it with cold water to clean the elements. Remove all utensils from Utensil Crock and put them in the dishwasher, then wash out crock. Go through your potholders, do some need washed or tossed? Give your counters a deeper wipe, as in move what's on your counter and wipe underneath them. Wipe the front of your cabinets. Wipe out the microwave, put the glass tray in the dishwasher. Use forced air to clean out your computer keyboard. Clean out the glove box in car…if you are like me you have several years of registrations…you only need the current one, as well as current insurance card. Sweep off front porch or back porch or both! Depending on the size of your junk drawer, clean it out or at least remove the obvious trash or things that don't belong. Look ahead to see whose birthday is coming…make a list of cards to buy or write the ones you already have. Need stamps? order them from the USPS. Sweep or Vaccum a room. One of my all-time favorite ‘appliances' is the Dyson Cordless V7 that I got for my birthday last year. It is so easy to take off of the wall, run over the kitchen floor and stash back up on the wall. It makes keeping the pet hair at bay and easy chore. And the cordless feature is the BOMB! Use your vacuum attachment and run it over your sofas and chairs. Use a clean 2″ paintbrush to clean your pleated lampshades. Rub a walnut over any scratches on your furniture, finish up by rubbing your finger over the scratch to warm the area and help the wood absorb the oil. It takes less than 3 minutes to make a bed…you could fit in 4-5! Or deep clean one bed by stripping the bed, vacuuming the mattress with your vacuum attachment and then re-making it. Put on a pair of rubber gloves and rub them over your furniture to remove pet hair. Wipe down your bathroom counters, front of cabinets and clean the toilet. Spend 15 minutes going through your makeup or prescriptions and remove expired, no longer needed or no longer used items. How many junk emails can you unsubscribe from in that time? How many emails can you delete? Any you need to respond to? Do you have a receipt you need to file or scan? You could surely get several air filters changed within 15 minutes. …what would be your 50th suggestion for quick household tasks? Bookmark this page or Pin this image of 49 Quick Household Tasks for the next time you can carve out a few minutes in your busy day. Interested in More Decluttering or Organizing Posts? And once again, if you have some quick household tasks that you are willing to share, please pass them on! By subscribing to Nourish and Nestle, we will only use your email address to send you emails (no more than 2-3 per week) that will keep you up to date with the latest news and content on the site. And please know that you can unsubscribe at any time by emailing me or clicking on the “unsubscribe” link at the bottom of all of our emails. In addition, you will have access to my growing library of knit & crochet patterns, as well as other printables. This library will continue to grow, so check back often. I cannot even tell you how much I loved this blog post. Great tips!!! Aw, thanks Kristi! It was good for me to write as it really made me realize how much we can accomplish in bite-sized bits…so much easier! Thanks for popping in my friend. This is the way I work most of the time too, Lynn. Not sure if it’s ADD or just too much going on but I get distracted so keeping it quick works best. It’s amazing what you can get done in just a few minutes. I knew we were kindred spirits! But I’ve got to be honest, I am new to this ‘quick task’ way of thinking, but it makes so much sense! #50 for me would always be scoop the litter boxes and sweep around them. Or shred a handful of documents and old bills. Oh yes Joan, the litter box ALWAYS needs attention. What a great one…and shredding documents is a perfectly quick task as well. I may have to do a sequel and will surely add your suggestions. In addition to my cordless Dyson vacuum which is so handy for kitchen cleanups, I splurged and bought a robot vacuum cleaner. I love it! Rhonda…Don’t you just love that Cordless Dyson? I get giddy every time I use it! And I might do another robot vac in the near future…I got one of the originals and I think the hair from our then 3 cats and dog was just too much for it.